Remember the 2014 world cup in Brazil when England failed to make it out of the group stages? Yeah, of course you do. I’m sure you’d rather forget it though. Or, perhaps better still, rewrite history by putting on a dazzling performance of your own at the tournament. 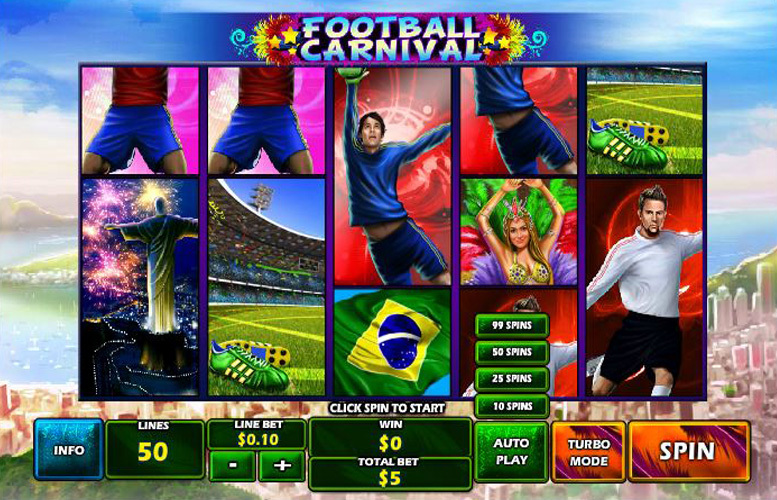 Now, you can do just that with the Football Carnival slot from Playtech. It’s a five-reel, three row game, and as the name suggests, is heavily inspired by both the sport of football, and the Brazilian passion for partying – aka Carnival! With added stacked symbols covering extra parts of the pitch for you, and up to a massive 50 win lines, you’re chances of scoring just got a whole lot better. Up to 50 pay lines. This hugely increases your chances of winning something on each spin. Interesting features. Stacked symbols, increasing multipliers during bonus rounds, and additional wilds make for a varied gameplay experience. The options to set the number of coins bet per line, and the value of each one means there’s loads of variation when it comes to selecting the size of your bet. The music. When you started your 99 spins auto-play, the music was probably a welcome addition, really making you feel part of the carnival spirit. Just a few minutes later, and it now resembles a drunken street mob banging on some pots and pans – kind of what carnival sounds like anyway. Either way, it gets old, fast. The only variety really comes from additions to the standard slot machine layout. There’s no “penalty shootout”, or similar bonus round. This feels like a missed opportunity to make this game a cracker. The symbols for Football Carnival are all inspired by football, Brazil, or the carnival. There’s a Brazilian flag, a football fan, a fully costumed carnival attendee, the famous Christ the Redeemer statue, and a football stadium. There’s also some less valuable ones, discussed later. The highest value symbols in the game is the “wild” one. Successfully hitting these across all five reels will pay out a massive 3,000 coins. This is followed by the Brazilian flag, paying 1,000, the fan at 500, the carnival girl is 400, and Christ the Redeemer and the stadium are 200, 150 respectively. The maximum possible coin value on Football Carnival being £5 makes the top possible win £15,000. If you’re lucky enough to spin in five-of-a-kind wilds whilst late in a bonus round, you could potentially walk away with a cool £75,000 – thanks to the increasing multiplier in effect during bonus spins. Despite its lack of additional bonus round taking us from the typical five-reel view, there are still plenty of interesting ways in which Football Carnival changes up the gameplay experience for the player. The Football Carnival logo represents the “scatter” symbol during the game. Three present on any reels will trigger a free spin bonus round. 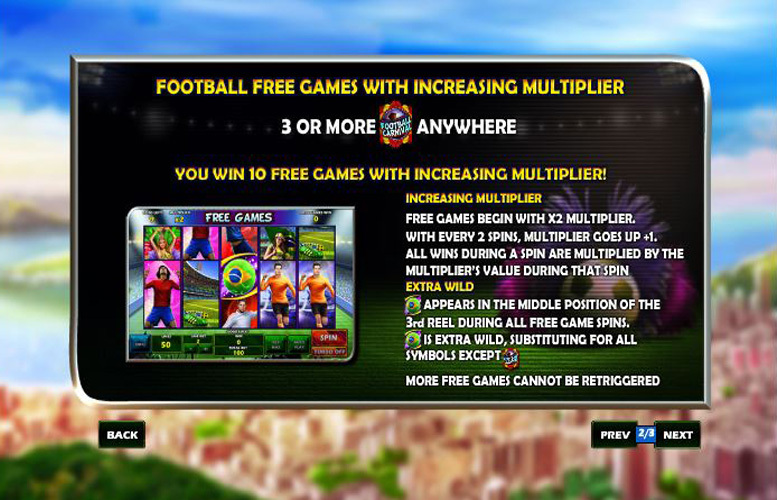 Every two spins, the multiplier increases by one, to a total of x5. The number of free spins is fixed at ten. Unfortunately, the game rules stipulate that additional free spins cannot be triggered during this bonus feature. The Age of the Gods bonus game is triggered by the appearance of three ‘Age of the Gods’ scatter symbols anywhere on the reels. 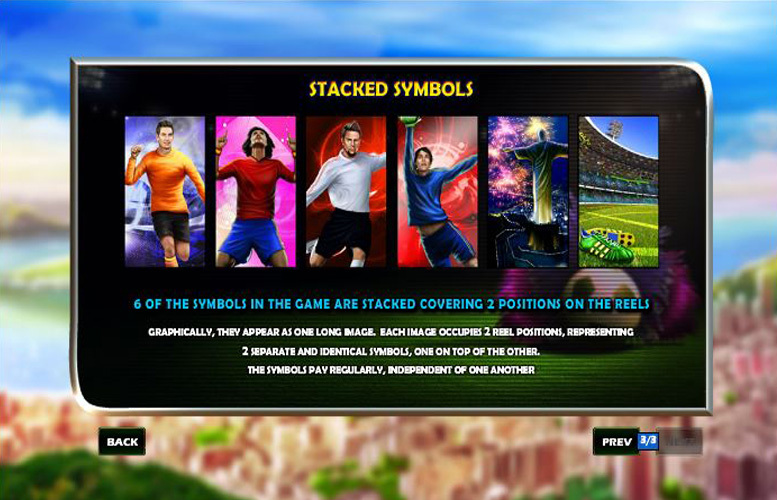 In the bonus game players must pick from 20 icons in order to try and reveal three matching god or goddess symbols. If they are successful, nine free spins are triggered and those spins will have different special features dependent upon which god or goddess’s symbol triggered them. One of the more unique aspects of Football Carnival is the inclusion of stacked symbols. These significantly increase your chances of winning. All the lower value symbols can appear stacked over two rows, spreading themselves across the board adding additional chances for wins across extra lines. These lower value symbols take the form of Christ the Redeemer, the stadium symbols, as well as four player symbols, seemingly dressed to represent national football teams. They appear to be Holland in the orange, Portugal in the red, England wearing white, and a blue goal keeper (I have no idea which national club has a blue keeper kit, my apologies). Being able to set different stakes, coin values and the number of win lines makes for a massive number of potential betting variations. It’s possible to play with a massive fifty active pay lines, and up to ten coins can be bet on each one. The minimum coin value is 1p, and the maximum is £5. This means that the largest potential bet is a huge £2,500 per spin, whilst the lowest is a single penny. 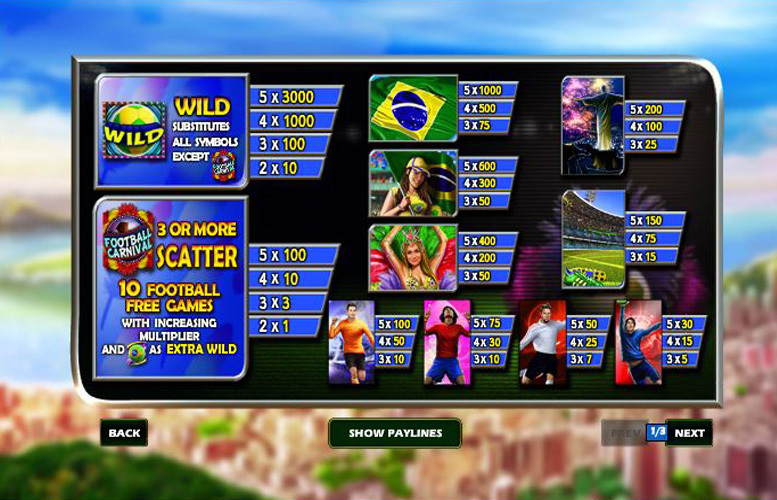 If you’re looking for a low variance, sports-themed slot, Football Carnival might be for you. It may lack an exciting additional bonus round but the steady gains that be built up using the increased number of ways to win may be enough to overlook this. This game has a rating of 4 / 5 with 389 total reviews by the users.